Dear MI Farm to School Supporters! This month is Farm to School Month and October15th is Farm to Preschool Day! With the abundance of local harvest that Michigan has to offer, this month is a wonderful time to highlight local foods in education programs. For early childcare and preschool programs there are great opportunities for planning activities with the children or special events around bringing fresh, healthy, and local foods to children 0-6 years old. Some examples could be: taste testing a new local food in your early childcare program, taking a field trip to a local farm, inviting a farmer to talk to the kids, or planning a local harvest meal with children and families. Farm to Preschool Day could also be as simple as trying a Michigan apple and talking to children about where our food comes from. Here are some links to information you might find useful for ideas! The Farm to Preschool website has a number of resources and ideas related to Farm to Preschool http://www.farmtopreschool.org . There is information including resources and curriculum in Spanish and English at the Occidental College, Urban Environmental Policy Institute's Farm to Preschool webpage at http://www.oxy.edu/urban-environmental-policy-institute/programs/food/farm-preschool .For those interested in creating edible gardens or having a garden planning day with young children for Farm to Preschool Day, take a look at Life Lab at http://www.lifelab.org and finally you might want to check out a fun and free curriculum offered by the USDA called Grow it, Try it, Like it! 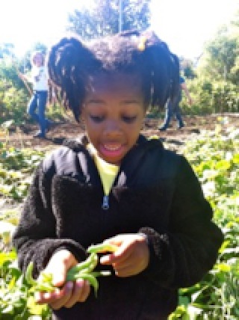 at http://www.fns.usda.gov/tn/grow-it-try-it-it . Have a great Farm to School Month and Farm to Preschool Day! And remember to keep it local!